Saturday is sitting-beside-the-fire day, chatting and listening to the Saturday newspaper. Pádraig really enjoys that. The company. The news. The comments. One day, he’ll be able to tell us what he thinks about what’s going on in the world. 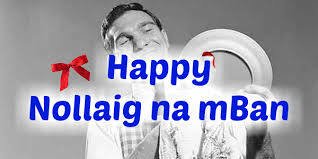 Today is also Nollaig na mBan, ‘little Christmas’, the day that women relax after the busy Christmas period and men take over the housework. In my mind, even the concept is strange. But – as over the Christmas period:) – I cooked a nice meal for the women in our family and joined in, together with Pádraig who ate and drank exactly the same food and drink we had. Mightn’t sound like much but it still feels like a small miracle each time he does it. Which now is every day. Three years ago, this night, we couldn’t sleep. Pádraig was in the Schön-Klinik. We were in Forbacher Straße. The next day, we were going to bring Pádraig, in an ambulance, to the University Hospital, the UKE, to see whether his tracheostomy could be removed – against the expressed, repeated, and long standing advice of his doctors. He was about to be discharged from the hospital and his doctors had decided that prior to his discharge he needed an operation to make his tracheostomy ‘safe’, i.e. permanent. We didn’t agree and had asked, for the umpteens time for a second opinion – and a removal. My nose is running, my head feels a bit dull, and I’m sneezing like a level one hurricane. And I’ve been listening to several radio shows about how people will change their lives in the coming year. At the moment, I don’t really feel like doing anything drastic any time soon. But, of course, doing nothing ain’t an option. So I’ll turn Pádraig, go to bed, pull up the blanket, and think of something nice that happened today. Like having a really nice dinner with the family and Pádraig beside the Christmas tree. Durmí como un gato, Ana. Casi sin consciencia 🙂 Gracias – y muchísimos abrazos y besos a Madrid!